The best service in the whole world.!!!!!!! The owner of company Jaqui kept in contact with me and went over details leading up to the party! Elsa and Anna arrived on time and stayed their whole allotted time. As they entered the back yard my daughter and other children were amazed and excited; they met each child and gave hugs. Then they read a story, Did some crafts and then nails and face paint. It went very smoothe. Next they sang happy birthday, played a game and had a Let It Go dance party! Finally each child got to walk the red carpet and my daughter was sashed. The whole experience was positive and I highly recommend! Thanks again! Almost every other company that I called was charging nearly double what Fairytale Dream Parties charged for one princess. I ended up with not one...not two...but three incredible princesses all for the price of what I would have paid for one princess from another company (for the same time spent). Um...thank you. Moving on from just the incredible price...let's talk about their flexibility (or their customer service was just so great that they made me feel like they were flexible to my nonsense...because there was lots!) I initially gave one date and location for the princesses arrive. The week of the expected paryt...I call...and change not only the date...but move the party about 30 minutes north of where we originally discussed. With no hesitation and without completely tearing me a new one (as they should have), she sweetly agreed to the change...and didn't even charge me extra for the fuel. Although...they may have just forgotten because of all of the other nonsense I threw at them lol. If so...give me a call! You guys deserve every cent! Now...the actual party. It was held at a castle in Haverhill, MA on this incredibly scenic hill! Unfortunately...the weather was nothing short of crap and of course...we experience our first "snow" of the season which was that wet, nasty stuff. You New Englanders know what I'm talking about. Prior to the party...I requested that they (the princesses) show up a little later (1:30 opposed to our arranged 1 pm) because I knew people would be late to the party which was supposed to start at one. Of course...because they're amazing...they showed up at the requested 1:30! Unfortunately because of the horrible weather...people were extremely late. Would you believe...these ladies actually accommodated us?!?!?! I was running around like a chicken with it's head cut off so I didn't even notice, but my sister approached me and asked "How long do you have them for?" I replied "An hour." With a look of total adoration...she looks back at the Princesses (who were holding hands with the kiddies on the floor in a circle doing something else adorable...) and says, "They've been here near two." Because children continuously trickled in and were shocked and amazed by them...they stayed longer than expected! I waited...for the bomb (the charge for the additional time) at the end of their appearance. Although we doubled our budget of $1500 and then some...smh...they were worth every cent...so we were OK with the extra charge. Oh wait...this is really my last thing!!! For years, I've managed to keep my daughter in line by telling her that she was a member of the "Princess Society". In her head...she is a princess. However...(ahhem) she was officially inducted into the Princess Society with an actual ceremony lol! Like...what?!?!?! How perfect!! We all stood in a circle, she recited a few lines, received her sash and sparkly wand and then commenced to walk down the red carpet with each princess!!! Ok. I'm done! Princess Anna did a wonderful job at my daughter's fifth birthday. She was great with the kids - very calm - and they hung on her every word. The activities planned all entertained the girls and filled the timeframe perfectly. The best part was the sing along. Hearing them all belt out the words to Let it Go (even though I've heard it about a times) was priceless. Jaqui was a pleasure to work with and really made an effort to accommodate a time that worked with our busy schedule. I would absolutely recommend Fairytale Dream parties! What else can I say that hasn't already been said! It was the best money I've spent on a child's birthday party. We had Queen Elsa come to my daughter's 4th birthday party and she stole everyone's hearts, children & adults. She read to them, did a craft, sang, danced, the works. She had all the moms and grandmoms nearly in tears of happiness because it was so amazing to see the joy she brought to those little girls. 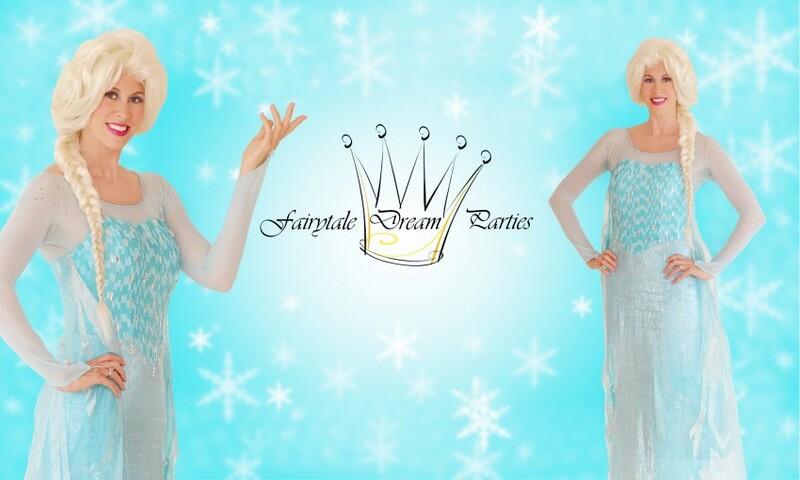 What a wonderful service Fairy Tale Dream Parties provides, can't praise them enough! Queen Elsa came to my daughter's 6th birthday party this weekend. She entered so gracefully and beautiful that she not only captivated the attention of the girls at the party but the adults as well. From the moment she arrived to the moment she left she made every girl (all 12 of them) feel like princesses. She read to them, painted their nails (while having a sing-a-long), played games, danced and sang happy birthday. She even rolled out a red carpet so she could give each girl her own special moment walking and waving while the parents took pictures. She was amazing. Thank You so much for making my daughters day even more special than she could have imagined. If you are looking for a princess to attend your event look no place else. I can't say enough about our experience with Fairytale Dream Parties! We had a 6th birthday party for our daughter at a local cupcake shop in our area & as soon as Rapunzel walked through the door, the children were amazed. Rapunzel had them make a crown craft, painted their faces, played a game, sang songs, decorated cupcakes with them & sang Happy Birthday. The best had to be the Princess coronation for my daughter & the red carpet walk for all the girls. It was amazing from beginning to end, all thanks to Rapunzel. She made every little girl feel so special, especially my daughter. I would definitely recommend them to anyone & hope to work with them in future events! We had the most amazing party with Elsa from Frozen. She was so stunning and such a princess. She had the girls' attention from the moment she walked in to the house. They made princess crowns, she painted their nails, danced with them, read a story, played a snowflake game and even sang Happy Birthday and passed out the cake. The most special part was they walked the red carpet with her hand in hand. She was so sweet and patient and really made these little 7 year olds dream come true. We enjoyed every minute and I would highly recommend Fairytale Dream Parties. I would be thrilled to have another party hosted by them. It was magical and memorable. I cannot thank Elsa enough! We had an Ariel party for my girls. Fairytale Dream Parties was fantastic. Ariel arrived to the delight of all the children. She spent ample time with all the children, painting faces, reading stories, playing games, and taking plenty of pictures. My girls can't stop talking about their party and are already planning which princess they want for their next birthday! From the moment Ariel & Belle arrived at my daughter's 5 year old birthday party. She was in complete amazement. From the roll out of the red carpet with a fashion show, to the dance party and games. It was dream come true for her. Her quote was "I can't believe Ariel sang to Me!" 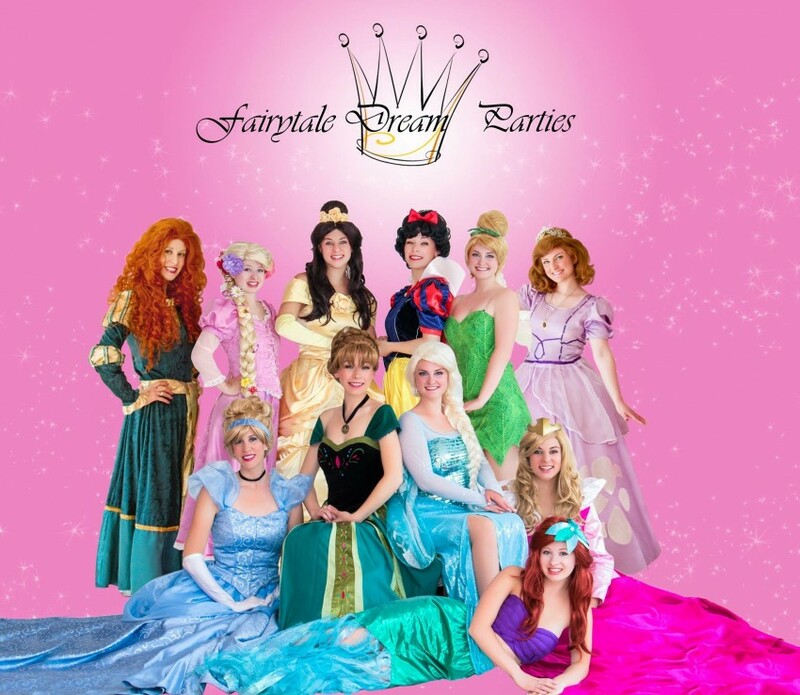 I highly recommend Fairytale Dream Parties to anyone looking to make their own little princesses dreams come true. Thank you for making a memorable day...that I know she will never forget. Thank you Fairytale Dream Parties for an amazing party today! All of the guests said they loved it and we couldn't be happier! Rapunzel was so sweet the children were just in awe of her. The activities she did with the children were so age appropriate and they all loved them. My favorite part was when Rapunzel sang and Bella sand along!! Bella was so so happy! Thank you. We had Cinderalla for my daughter's fourth birthday party, and with a newborn, I was hoping someone could come in and take over and make the party a treat for everyone. Cinderella captivated the girls from the moment she walked in and ran the show. She answered endless questions cleverly and sweetly and the girls were amazed. It was everything we hoped for and more. Fairytale Dream Parties put on a truly magical party for my 6-year-old daughter's birthday! Before the party, Jacqui was always available to answer questions and help as I planned. And on the day of the event, she and her staff handled everything from activities to favors with ease. The girls were thrilled! I hired Fairytale Dream Parties for my 6 year old daughter's b-day. Our princess was prompt, enthusiastic and all-around awesome. Highly recommend!! 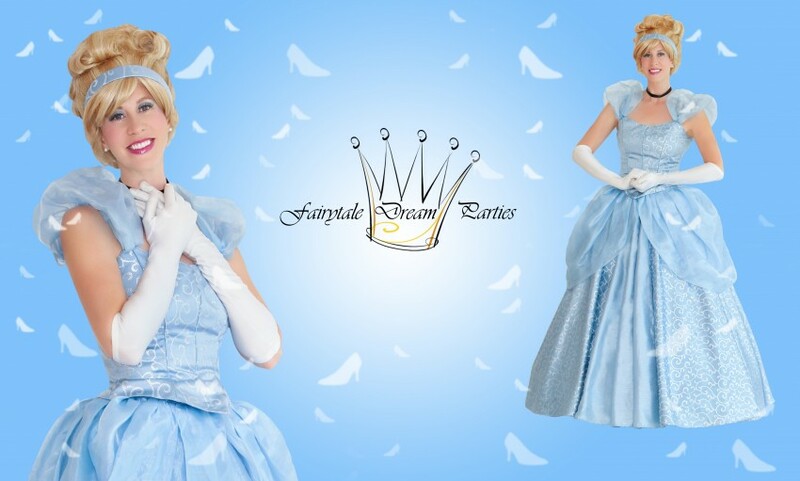 Fairytale Dream Parties is a professional character company specializing in princess birthday parties. Our attention to detail, professionalism and experience with children can not be matched. Imagine your daughter's surprise when her favorite fairytale princes arrives to party with her on her special day. 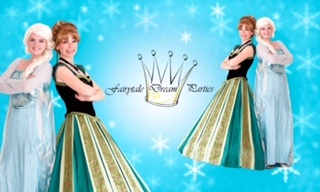 Our custom made gowns and wigs offer the most authentic fairytale experience and truly make our company unique. Sit back and relax while we make memories that will last a lifetime. We promise nothing less than an enchanted experience.